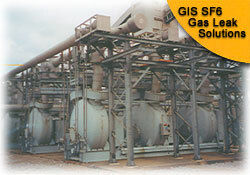 SF6 gas is expensive and has been designated a “greenhouse” gas by the EPA. Therefore, it is important for electrical utilities to control circuit breaker SF6 leaks. TDS has a vast amount of experience repairing SF6 leaks on circuit breakers and additional components of Gas Insulated Substations (i.e. piping, flange connections and seam welds). The skilled technicians of TDS can address all sources of SF6 leaks, resulting in large cost savings for the utility by avoiding component disassembly and associated downtime. Accurate detection of SF6 leaks is required in order for TDS to propose a repair method. Traditional circuit breaker SF6 leak detection methods can sometimes be unreliable. Click the link below for details on a new infrared scanning technique that has proved very useful for detecting SF 6 leaks in circuit breakers. SF6 Circuit Breaker Repair Procedure: Infrared SF6 Leak Detection. SF6 circuit breaker leaks typically occur between the porcelain and base mounting flange or at bushing end cap locations. Click the links below for details on how TDS technicians can reliably repair these leaks with custom designed clamps and our rubber-based, non-adhering leak sealant. Oil circuit breaker leaks are repaired in much the same way as transformer oil leaks. Leak locations are at OCB bushings and drain valves can be reliably repaired with drill and inject procedures or custom designed enclosures or clamps injected with our rubber-based, non-adhering sealant. Click the links below for details on these procedures. Contact TDS today to arrange for our free Substation Survey. TDS repairs your SF6 and oil circuit breaker leaks or you don’t pay.